After stealing the ball from Shai McGruder (23) Makayla Cooper storms down the court. 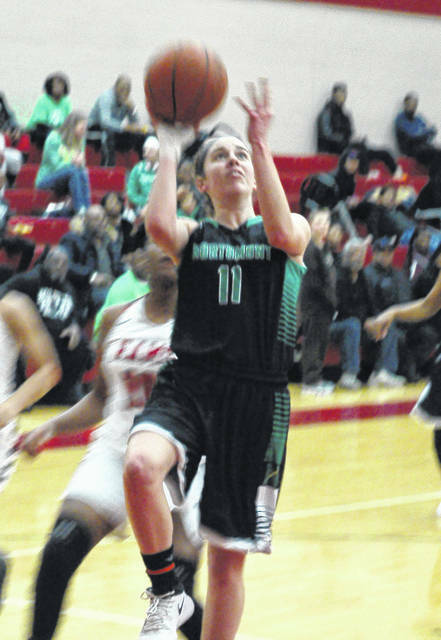 Cooper led Northmont with 20 points. Jenna Hoschouer scores inside to tie the game midway through the third quarter. 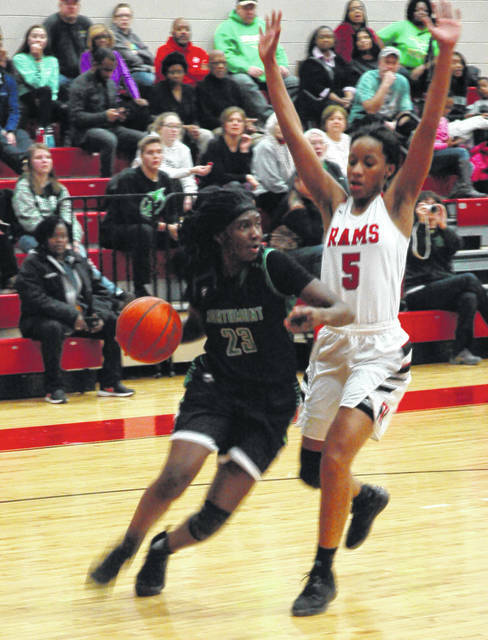 TROTWOOD — If not for Shai McGruder running wild in the first quarter when she scored almost half of her game-leading 33 points, Northmont might have emerged victorious Thursday at Trotwood-Madison. Northmont made adjustments in the second quarter to limit McGruder to four points. Trotwood got eight points from Sha’ Mya Leigh, including a pair of 3-pointersm and Mercedes Woodward scored six in the fourth quarter as Trotwood held on to post a 72-63 victory. Trotwood went on an 8-0 run with McGruder coming up with a steal and three consecutive baskets to put the Lady Rams up 17-8. Northmont got a free throw and a 3-pointer from Makayla Cooper (20 points) and Kaitlyn McCrary got a rebound and scored to cut the deficit to 17-14. Trotwood held a nine point lead by quarter’s end but the Lady Bolts kept chipping away to cut Trotwood’s lead to 35-32 at the half. Jenna Hoschouer scored back-to-back buckets inside the paint to tie the game 42-42 with 4:24 remaining in the third quarter. 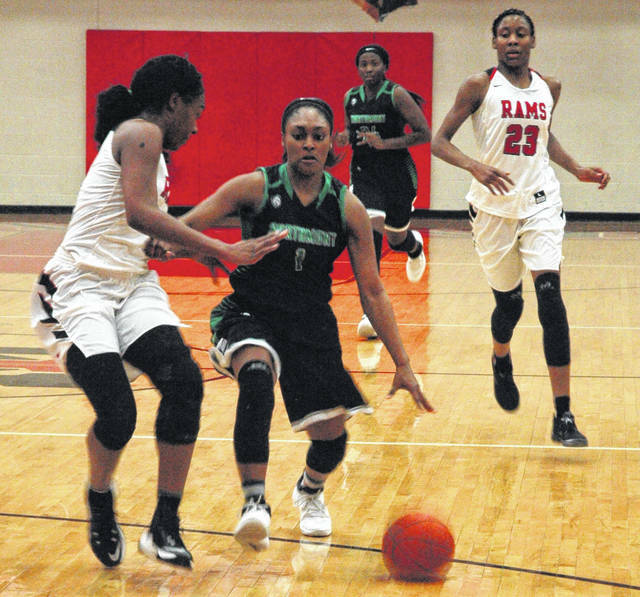 Trotwood regained the lead but Cooper buried a trey to tie the game at 51 late in the quarter but the Lady Rams held a two point advantage entering the final eight minutes of play. Cooper buried another 3-pointer to put Northmont on top 54-53 on the first play of the fourth quarter. Leigh countered with a 3-pointer for Trotwood and added another trey about a minute later to put the Lady Rams up 60-54. Northmont pulled to within four but Trotwood began to pull away. The Lady Rams scored a pair of baskets and converted six of eight from the foul line down the stretch to post a nine point victory. Northmont: Makayla Cooper 8-1-20, Kaitlyn McCrary 2-0-4, Jenna Hoschouer 3-1-7, Anna Mangen 1-0-3, Salena Roberts 3-3-9, Camryn Nadir 3-0-7, Shalaya Heath 4-5-13. Totals: 24-10-63. Trotwood: Myla Barnes 1-2-4, Essence Thornton 0-2-2, Sha’ Mya Leigh 5-1-13, Mercedes Woodward 4-1-9, Millani King 0-1-1, Kellah Flucas 4-2-10, Shai McGruder 14-5-33. Totals: 28-14-72. 3-point goals: Northmont 5 (Cooper 3, Mangen, Nadir); Trotwood 2 (S. Leigh 2). Records: Northmont 10-10, Trotwood 18-2. JV Score: Northmont 44 Trotwood 40.